Treat your hair to the replenishing properties of Manuka Doctor's ApiRevive Restorative Hair Mask, an intensely nourishing hair formula that works to restore lost moisture and promote weightless volume. Deeply nourishing, the rich, creamy conditioning treatment combines Manuka Honey, Manuka Oil and Abyssinian Oil to expertly soften and smoothen your tresses whilst maintaining a healthy scalp environment. 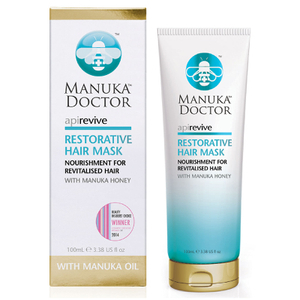 Its revitalising nature targets damaged hair to help reduce breakage and detangle for improved manageability. Natural goodness is rediscovered and hair feels incredibly hydrated and conditioned. After shampooing, towel dry hair and apply a generous amount to hair, comb it through and let it penetrate for 7-10 minutes. Rinse out thoroughly. To be used once or twice a week. Aqua (Water), Cetearyl Alcohol, Glyceryl Stearate, Behentrimonium Methosulfate, Crambe Abyssinica Seed Oil, Parfum (Fragrance), Mel (Honey), Quaternium 87, Phenoxyethanol, Benzyl Alcohol, Disodium Edta, Ethylhexylglycerin, Leptospermum Scoparium Branch/Leaf Oil, Butylphenyl Methylpropional, Linalool, Alpha-Isomethyl Ionone, Limonene, Hydroxyisohexyl 3-Cyclohexene Carboxaldehyde.